“This is not a conflict over elections. It’s the Honduran people rejecting the policies of plundering, death and violence of the State”, says Berta Zúñiga Cáceres, who coordinates the Civic Council of People’s and Indigenous Organizations of Honduras (COPINH). In an interview with Colombia Informa, she spoke about the current situation in her country after the electoral fraud, about the 25-year-long struggle of her organization and the two year anniversary of the assassination of her mother and founder of the organization, Berta Cáceres. What has been going on in Honduras since Juan Orlando Hernández took office after an election riddled with claims of fraud? Resistance on the streets has continued, albeit a little less frequently. But many sectors continue to mobilize intermittently. On the other hand, there has been a strong repressive response by the government and around 40 people have been murdered. A commission has been created within the Organization of American States (OAS) supposedly to arrange a “national dialogue” and mediate between the President and other sectors. The reality is that the people are left out of this dialogue and their demands have been completely ignored. What the OAS wants to accomplish is whitewashing the image of the government and legitimize corruption. This so-called dialogue is mediated, among others, by former president of Guatemala Álvaro Colom, who is under investigation by the International Commission Against Impunity in Guatemala (CICIG) for corruption. People are still indignant because this dialogue does not solve in any way the unrest that exists in the country. The people, obviously, are thinking about carrying on with a more prolonged resistance. And also about beginning to carry out the project to re-found Honduras, a project created shortly before the 2009 coup d’État—nevertheless, it continued to be upheld and developed. To resume the project to re-found the country also entails resuming contact with the victims of State crimes, with families, with communities and with organizations who right now have political prisoners—something that isn’t being talked about anywhere. These are family-members of people who have been murdered in this struggles. 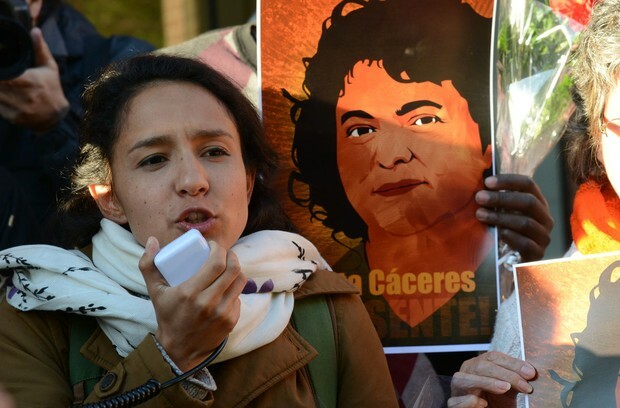 Berta Zúñiga Cáceres is the daughter of the late Berta Cáceres, who co-founded COPINH and held the position of Coordinator until the day of her death. What stance does the COPINH take in the current political context? The Civic Council of People’s and Indigenous Organizations of Honduras does not take part in electoral politics. However, it is not indifferent to the issue of electoral fraud, of the permanence of the same people in power, of plundering and repression of our communities. Juan Orlando Hernández means all of these things for us. We’re seeing that this context will bring a lot of instability for the country, governability will become more difficult and the government will solve this though military repression. We see that the security forces of the State come out of this situation with more strength, but the President doesn’t. The project of re-founding Honduras is important to us because we maintain that the answer and the solution to this crisis is not a change of President but a change of the entire institutional system, which is completely rotten. This project consists in creating a National Assembly to create a new Constitution which has to be inclusive, put the people first and deeply transform the State of Honduras. To us, as an organization,the struggles in defense of the territories are of utmost importance. Our communities are facing a harsh reality: the presence of companies that exploit the land and the rivers. But there’s also a larger struggle regarding the rights of indigenous peoples, the demilitarization of territories, the guarantees of non-repetition of state crimes, the search of justice for victims of the fight against extractivist projects. This March, COPINH will celebrate 25 years of existence and resistance, and commemorate 2 years since the murder of Berta Cáceres murder. What has changed in Honduras since the COPINH was founded? During the last 25 years, the COPINH was a part of the history of popular struggles in Honduras, but there are also many other loci of struggle and resistance in the country. Our organization that has a more confrontational attitude against the government. We began to propose that we don’t have to ask, but we have to demand that governments fulfill their obligations. COPINH emerged at a time that was difficult for indigenous peoples. Today, the country is still going through a very difficult time. The struggles for the liberation of the territories for the integral justice of the communities is still very real. The context has changed, but the substantial elements of oppression against indigenous communities, of plundering the territory, of State repression against the communities, is still going on. What has definitely changed is repression: now it’s done in a much more professional, refined way. By joining the celebration of 25 years of struggle with the two-year anniversary of Berta Cáceres’ murder we bring attention on the fact that the authorities of Honduras (a State that violates human rights) still does no justice for our comrade and for the hundreds of people who have been murdered in this country. What’s next for us is contributing to the struggles of the social movement of Honduras against the State, defeating extractivist companies and denouncing the abuses of the government of Honduras. 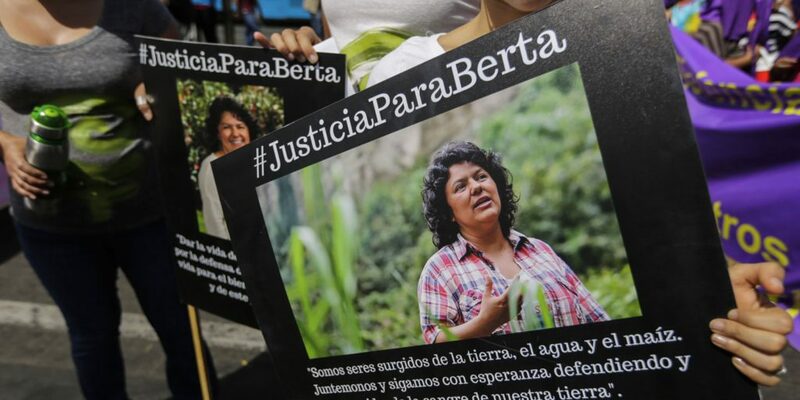 How is the legal case for the murder of Berta Cáceres evolving? We’re about to attend the audiences of proposition of evidence. The State is beginning to get desperate due to this case, which has been badly mishandled, and a series of deep irregularities which would never have happened if due process had been respected. They are also beginning to take desperate steps to close the case and try to convince the public that justice has already been done and avoid being blamed as intellectual authors. The State want to close the Berta Cáceres case with this trial and pretend that all of the authors have been condemned. When reading about the current political context in Honduras and the history of the country, we can find many similarities with the history of Colombia. What strategies could be implemented in order to unite the struggles in internationalist solidarity? COPINH has carried out internationalist work since its inception. It has been the epicenter of coordination of the struggle against dams, against militarization and for cooperation between peoples. Many organization who struggle against the economic model based on extractivism have the same goals. Obviously, at the same time that we fight against this model we have to propose a different model, so we have to develop a program to solve the energy problem, which is strategic for the entire subcontinent of Latin America. It is very important to keep on learning from other peoples’ strategies to defend their territories. We don’t have the power to modify laws or to control the concessions of land. But what we can do, and we have done (and Berta Cáceres was an example of this) is putting up a strong fight to defend the territories and preventing the construction of hydroelectric dams. In this process, the COPINH has learnt a lot from the forms of autonomy and resistance of other indigenous peoples and of the Colombian people. They have taught us to confront military and paramilitary structures and the brutal violence of the State.